Mugshot is the website that continues to surprise me the more I use it. 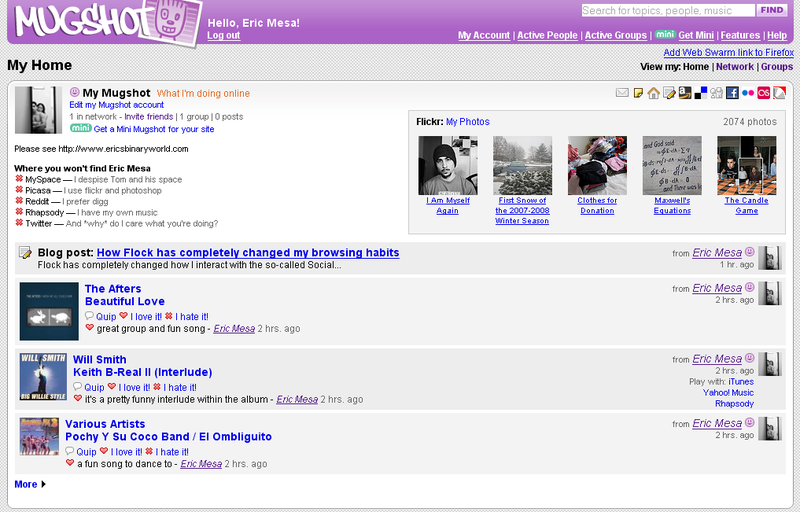 At first it was just a website with an unusual purple theme. 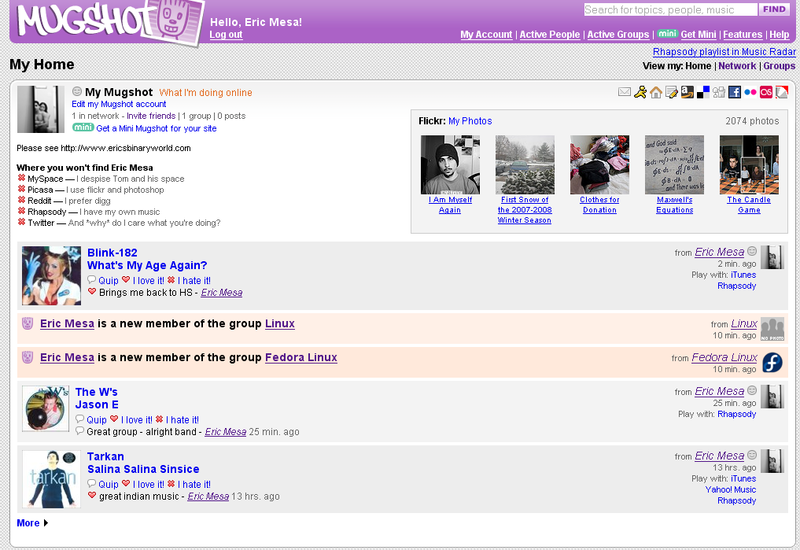 Then it was the very frustrating site with the purple theme. Now it just may be one of the most interesting and underrated sites of the year. In case you haven’t clicked on the link yet, Mugshot is a social web aggregator. You sign up to Mugshot and then let it know about all of the social networks you’re a part of such as Flickr, Facebook, Myspace, Twitter, delicious, Picasa, digg and Reddit. Additionally, you add in some feeds from Amazon.com, last.fm, and Netflix. Finally, if you enter your blog address it tracks new posts. It then uses this to track all of these in one convenient place. The thinking is that you and your friends all sign up for Mugshot and then you have one-stop-shopping to find out everything that’s up with your friends. So there are some icons on the top right representing different networks I’ve given them info for. Clicking on those will take you to my blog, amazon wishlight, etc. Directly underneath are my 5 most recent flickr photos. To the left are the services I’m not a part of and some little messages about why I’m not a part of them. For some of them I used the canned messages and for some of them I came up with my own messages. Underneath that are all of the status updates concerning me. You can see the blog post I did yesterday followed by the last three songs I’d heard. In an interesting little twist I can comment on whether I like or hate each song (or just do a neutral quip) and, presumably, so can everyone else who’s my friend. In fact, I feel like I’m probably not getting close to 50% of the benefit of this site without having my friends sign up too. So one runs into a Chicken-and-egg problem. I will have a bit of trouble convincing them to join because none of their friends will be on and so forth. But I’ll give it a shot and see if I can report on what advantages it gives me. So you see that now all people see are the songs I’ve recently played which I want to share, but not at the expense of people knowing about my blog – which I care about more. So, just as they’ve put the flickr photos into its own box, I’d like to see the blog posts get a box and the music get a box. That way each category can only obliterate information related to itself. And, of course, they can always give people the option to have it back to this way, if they want. Ok, the second thing that needs to be improved is that I think the site needs to employ AJAX or whatever technology is needed to have the updates happen automatically. For example, the last.fm widget I have on this blog updates with the latest music I’m listening to without you needing to refresh the page. If I have Mugshot open and my friends are on there too, I’d like to see their information update as they add new information. Perhaps having it happen live would be too much of a strain on the servers, but perhaps every 5 minutes or so would be nice. So far I only have one pet peeve with Mugshot – not every song is added. I don’t quite understand the algorithm they use to determine whether a song is added to the Mugshot profile. Sometimes a song is added and sometimes it isn’t and I haven’t been able to figure out the criteria they use. Well, that just about wraps up Mugshot. I’ll revisit it once I get some friends signed up and see what benefits, if any are provided. My next post will be about the Online Desktop which is being developed by people at Gnome and Red Hat and is tied into Mugshot.